Though few viewers were aware of the connection, the sixty-fifth anniversary commemoration of the historic D-Day landings on June 6, 2009, were situated in the very spot used for the opening scene of Steven Spielberg’s 1998 movie, Saving Private Ryan. 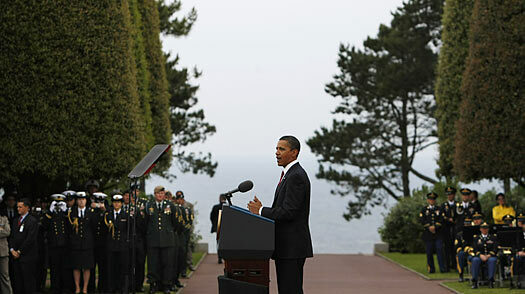 The venue for both was the 172-acre American Cemetery and Memorial north of the town of Coleville-Sur-Mer on bluffs overlooking Omaha Beach. “Bloody Omaha,” one of five destinations for the Allied forces storming Nazi-held Northwestern France on that momentous day. The connections were enhanced by C-SPAN’s cameras cutting away occasionally to actor Tom Hanks, who played the heroic but fictitious Captain John Miller in Spielberg’s movie. There may indeed be deeper and more embedded popular culture resonances between the choice of a movie plot and such sobering ceremonies marking a major historic event. But this essay focuses on another theme: to what extent does this televised commemoration depict what some of the small screen’s defenders have described as “television taking itself seriously” (David Bianculli) or what others call “Bardic television"? Bardic television is that ascription given by culture critics such as John Fiske and others who assign a pivotal communitarian role for television. This is effected by bringing together disparate elements of a culture around a shared moment of sustained reportage or reenactment of major events in the life of a society. The small-town general store writ large. Professor Leonard Koff of UCLA’s School of Renaissance and Medieval Studies has described the epic as memorializing “significant events in the life of a culture.” The accent is on seriousness and meaning, large-scale enough to allow for a range of feelings to register. The rage of Achilles slowly transmuting into the pity of Achilles in The Iliad is one example, as is the building up of Satan at the beginning of Milton’s Paradise Lost and his humiliation as a hissing dragon by the end. “The mood,” says Koff, “is serious, not playful, more like a theological moment than lyrical.” Beowulf figures here as does Virgil’s Aeneid. It is not a sweeping exaggeration to recall how at certain focused periods in time television has been able to be transcendent and epic, from its infant beginnings in the postwar era when veteran broadcaster Edward R. Murrow showed cameras beaming in on San Francisco from his CBS perch in New York City. The televised opening of the St. Lawrence Seaway by President Eisenhower and Queen Elizabeth II in 1957 fits in here as does, most memorably, the three-day trauma of the Kennedy assassination and funeral in November 1963. Also fitting this paradigm is the moon landing by Apollo 11 in July 1969. These are all events that led to large-scale reflection and commentary as in President Nixon’s proclaiming of the epic voyage as the most important event since creation. And we saw it all on the small box. The “intimate medium’s” ability to convey large-scale incidents in small-screen focus is sometimes remarkable. Canadians will remember the words “Henderson has scored for Canada” to end the 1972 Soviet-Canada hockey series as TV sets were wheeled into classrooms all across the vast dominion. Similarly, sportscaster Al Michael’s “do you believe in miracles” forever freezes in time the American hockey team’s victory over the Soviet Union at Lake Placid, New York, in 1980. These are magic moments impressed upon those who were watching, moments never to be forgotten. John Girardo, an award-winning scriptwriter teaching at the University of Toronto at the time, recalls sending his class home the week Operation Desert Storm began in January 1992 to watch the whole proceedings on the relatively new channel of CNN. “They’ll learn more from this 24-hour coverage than they ever could in a classroom,” he said later. Desert Storm, the first Gulf War, Princess Diana’s funeral in 1997, Peter Jennings's broadcast on 9/11 - these events remind us again of our theme, the 65th anniversary proceedings of D-Day as another testimony to the power of Bardic television. This time the small screen rewarded its watchers by binding together, however briefly, an enduring abstraction known variously as “the Atlantic Community,” the Western Alliance, and even more grandly, Western civilization. The framing dynamics of C-SPAN, now in its thirtieth year of its commitment to sublimate editorial in a longer-form context than is normal for television, a determination to “let the viewers see for themselves,” this format seemed particularly suited for this historic occasion. The entrance of five national leaders - Sarkozy of France, Obama of the United Sates, Prince Charles and Gordon Brown of Great Britain, and Canada’s Harper - against the backdrop of a destroyer situated offshore on the azure shoreline now known as “Omaha” left a striking impression. One normally enters this largest American Cemetery in Normandy from the south where the walkways are shaped in the form of a cross. The 9387 graves are off to the left with headstones facing west, towards the United States. Turning right, visitors notice the reflecting pool and the pillared columns of the colonnaded shrine which reminds them of the newly opened massive World War II memorial in Washington, D.C. It is a fit setting for a grand occasion, and the presence of some 288 veterans on June 6, 2009, added a marked degree of somberness and sobriety just as it did when President George W. Bush marked the occasion with a heart-felt speech here on June 6, 2004. The occasion and the setting seemed to coax the best out of the four national leaders who spoke from a podium set on a red carpeted dais facing the veterans. In short, it is the kind of grand scene that television cameras eat up greedily. Color and colonnades, flags and uniforms, medals and berets, the blue sky, the verdant French countryside - these make for superb visuals that speak for themselves. C-SPAN”s “done but not overdone” dynamic spoke to the occasion. The four speakers were seated in front of a bronze statue built by a sculptor from New Jersey titled “The Spirit of American Youth Rising from the Waves,” a resurrection motif. This was designed to gently remind onlookers of the 10,000 young men who did not rise from the beaches that murderous day along the Normandy Coast. All filmed events can do this - we are both in France and not in France, we are there on June 6 with Barack Obama and yet we may be watching his speech later that evening. This gives the filmed spectacle the sense of what Keith Cunningham calls an “out of the body and flying” experience. This can render our sensibilities more plastic and capable of transmutation. This of course is a double-edged value, as the films of Leni Riefenstahl - Hitler’s favorite film-maker - reminds us. The point to note about the filmed commemoration of D-Day is that television - ultimately dependent like Hollywood on the un-passionate camera eye - has these four aesthetics and more. Horace Newcomb sees primary among these the values of intimacy and continuity. Intimacy was a feature of the small screen from the beginning, one reason being, according to Paul Rutherford in When Television Was Young, the small set was treated as part of the household furniture. Housewives placed familiar objects on it, and it even needed dusting. This differs from the more forcible effects of a blown-up three story screen we see at the movies. “Television is at its best when it offers us faces, reactions, explorations of emotions registered by human beings…the human response,” says Newcomb. One has only to think of Jack Benny’s deadpan or Wayne Campbell’s daffy “ex-saw-lent" to grasp the point. On June 6, 2009, C-SPAN’s cameras kept cutting back from the four speakers to the overview of the cemetery, to the faces in the crowd. The most acute reactions were reserved, appropriately, for the faces of the veterans which, because they were real vets, displayed a range of emotions. These ranged from rapt attention, to a disdain for politicians who (they no doubt mused) were nowhere in evidence that murderous June morning. The most poignant scenes of all were the aged ones holding their heads in their hands from sheer weariness or already fading off in sleep. These were scenes C-SPAN was not too embarrassed to relay: the human factor. Others were filmed staring off into space conveying with their expressions an almost ghostly sense that this may well be their last visit to what they themselves had nick-named “bloody Omaha.” It was this very human interaction of the aging, sometimes wizened faces of the men of D-Day with the placid surroundings and the measured words of the speakers that provided a sense of Newcomb’s continuity to the visual narrative. Continuity was also there in the close-ups of the leaders, Barack Obama - so well known to international audiences already; Prince Charles of Great Britain representing his mother the Queen, himself an unintentional pop culture fixture from the associations with Princess Diana, his first wife. These close-ups also included what might be stated somewhat irreverently as “the babe factor” - sharp profiles of the photogenic Michele Obama, the softer but pleasant visage of Mrs. Sakorsy and the Canadian Prime Minister’s wife. Yes, of course. That said it all. That’s exactly what they were thinking as any glimpse at the ECU footage of such documentaries as Victory at Sea would attest. And here was Newcomb’s human factor summarized in Sarkozy’s moving testimony, building upon the superb “sets,” the framing devices of the cameras and their crews, and the pervasive, palpable sense of history that hangs over such places as Omaha Beach. When, on June 6, 1984, President Ronald Reagan spoke eloquently of the “boys of Points du Hoc,” of U.S. Rangers losing 135 of 225 men to gain the cliffs to the west of Omaha, even Presidential critic Lou Cannon was moved. In the end, C-SPAN’s very penchant for lack of verbal commentary, for relaying as much factuality as the selectivity of camera placing and perspective can offer, this technique skillfully interpreted and preserved these moments, relayed them across the waiting Atlantic and replayed them again for audiences to watch and scholars to study and unravel. A public service par excellence. The Myth of D-Day, the myth that is not all myth any more than the funeral pyres that burnt for Hector and Beowulf, such events, well presented, can sometimes leap across historical time to say something about the collective values of a people. “People watch. People care,” wrote David Bianculli in Teleliteracy. “Only idiots continue to think of it as an idiot box.” Bardic television in particular has this redeeming quality: to bind us together in a shared collectivity of the small screen, if only for a day, if only for a few memorable hours and, in so doing, live up to its vision as a valued historical record in its own right.